Our Fish Handle One Pint Pewter Tankard measures 5.11 inches tall by 3.14 inches wide. This high class pewter giftware will not tarnish, and in fact often improves with age, making it ideal for commemorative gifts to mark special occasions. This one pint tankard is the ideal gift for a keen angler thanks to the quirky fish shaped handle which adds a bit of zany flair to the sleek style of the straight body which is detailed by some simple horizontal lines. 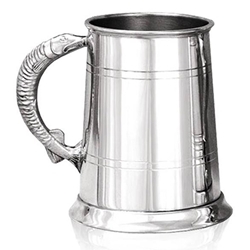 Your professional engravers can add a personal engraved message to the tankard.